So the whole buttonless shirt dress for my birthday didn't really work out. It's not so much that I dislike the pattern, besides the fact that I had to add seam allowances. It was mostly just a lot of bad choices that compounded into one dissatisfying dress. The questionable fabric I bought from the red tag section of Joann probably wasn't the best choice. It seemed to have some stretch to it, which just didn't seem to work for this dress. I don't know why it puckers at the center front seams, but it makes me want to light myself on fire every time I look at it. Thent I forgot to add seam allowance to one side of the front piece because I thought I was supposed to cut it on the fold. I tried to compensate for this by adding a continuous placket instead of just following the directions and folding in the edges twice to make front placket. The results were just okay. And then I put the belt loops about 3 inches lower than where I wanted, and had to take out about 4 inches on each side on the hips. Also, what the hell was I thinking? This was definitely not a "Hey I'm turning 24 let's go bar-hopping" kind of dress. It's more of a "Hey, cover me up with a cardigan and do some office work" frock. 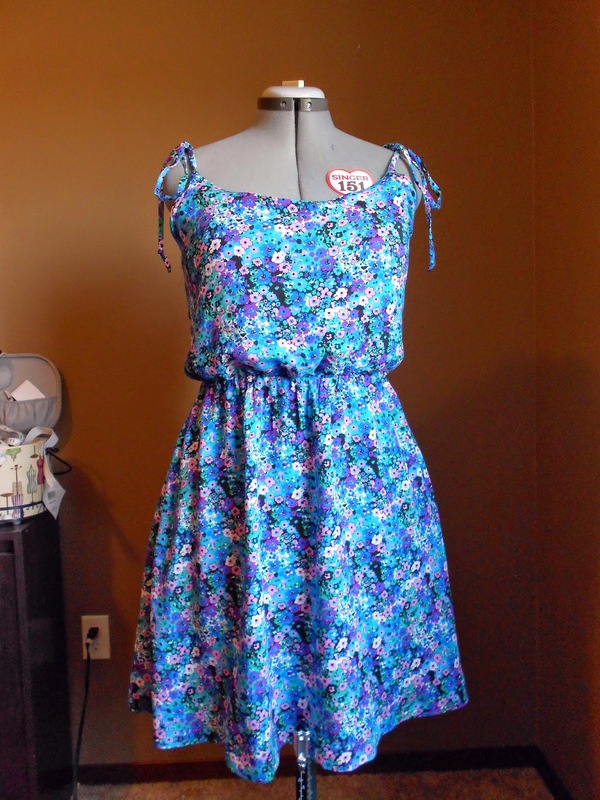 On a happier note, I made a Sewaholic Saltspring Dress and I am absolutely in love with it! I cut a straight size 12 and love love love Sewaholic's sizing. I usually have to grade out two sizes to fit my hips into my garments, but not today. Damn you, hourglass shape! Needless so say I will be making up a lot more Sewaholic patterns. The fabric is a wonderfully drapey rayon challis from Hancock Fabrics. The flowers are just the right size and I'm in love with the colors. This was your typical "I just need a zipper OMG LOOK AT THAT PRINT" impulse buy. Wait, is there any other kind of purchase in a fabric store? I decided to forego the back zip at the last minute. Mostly because I got lazy but also because I ended up not needing it. Double win! I think I used up all my ambition putting pockets into the dress and just couldn't be bothered inserting a zip. I usually skip pockets with wovens because serging all those round edges gives me heartburn. In the end it wasn't that bad and I'm really pleased that I added them. They're so cute! I think that when I make this again I'll do two straps on each side, or maybe go with thicker straps. I just feel like I'm putting all my eggs in one basket with those thin little straps. 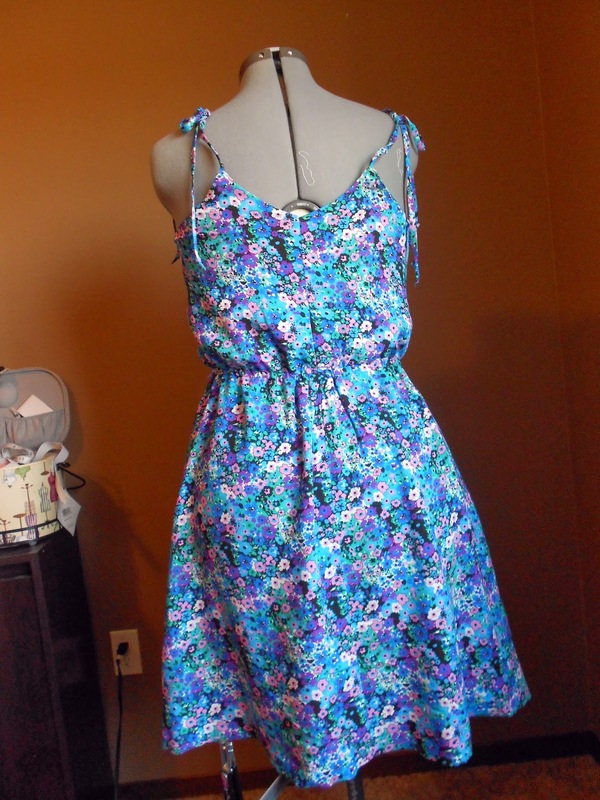 This dress is a big success for me, and I can definitely see myself wearing it a lot this spring/summer. It's super flattering a I'm in love with my fabric choice. I may have to wear some spandex underneath on windy days (read: everyday in SD) because this dress is definitely breezy! I have a lot of tops that I need to make because I may or may not have signed up for Me Made May. I'll probably do a separate post for that though. I have a lot of things to talk/freak out about! Oh man, I so know what you mean about weird cheap fabrics and puckered seams! If you ever decide to fix it (it looks comfy and the collar is lovely), using cotton or silk thread makes a huge difference. Your blue dress is lovely! For now that dress is the sole occupant of the "ew" part of my closet. I'll definitely look into the cotton/silk thread though if I ever decide to fix it. Thanks!